The first time I ran the Rye Ten Mile, I was deceived by the name into thinking that it took place in Rye itself, and that runners took part dressed as characters from E.F Benson’s Mapp and Lucia stories, or, even better, as characters from Henry James. In fact, the race takes place in Peasmarsh, a few mile north of the town, and goes nowhere near Rye itself. But it’s a gorgeous rural route, on lanes, in and out of sunlight, past pretty cottages and grander houses. The woods are supposed to harbour wild boar, but I only saw a dead badger. In 2012 I was delayed by a guerrilla car boot sale. I took no chances this time and came a different way arriving with sufficient time to stare at some crossword clues in the car before my pre-race routine of inhalers, Body Glide and a visit to the lavatory. We lined up for the start, I thought a little depleted, though the results show there were two hundred of us. Off we went and, as ever, I think I went too fast in the first two or three miles. The route goes out into the woods, takes a long loop between the three and seven mile points and then returns to the race HQ the same way as miles 0-3. At mile 2 or so, there’s a steep descent, which reminds the wary runner that he will have to go up this on the way back. It feels very hilly, though I see my total elevation gain was only 236m (that’s a bit under three consecutive ascents of Seaford Head). I was passed by younger fitter runners, and some older ones too, but I kept a rhythm of sorts going. The route was cheerily and efficiently marshalled, and well watered, with stops at 3, 5.75 and 7 miles. After the seond water stop I inhaled an insect, which caused a coughing fit that lasted for a mile or so, but resolved itself. For the last few miles I was running on my own. There were runners behind me but so far that I could not hear them and, like jockeys, I don’t believe in looking back, while those in front were long gone. The hill at eight miles was tough, but I resisted the temptation to walk, and I ran back to the finish, arriving as the prize-giving was in full swing. 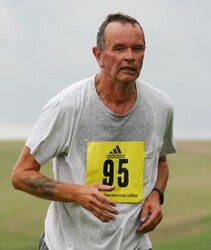 The first man, Tom Mullen of Haywards Heath Harriers, finished in an astonishing 1:01:39. See Nice Work’s results page for full results, including my own 1:50:05. The last time I ran this race, I achieved 1:43:25.
it’s not often I can claim to have been the first member of the Seaford Striders home in a race, but on this occasion I was, as I was the only club member running. I was rewarded for this by water, all the melting Jaffa cakes I could eat, and a hefty medal which one of my cats attacked when I returned home.